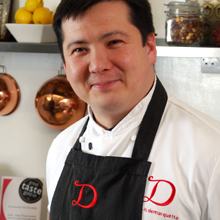 Marc-H. Demarquette was born in 1972 to a French father and Chinese mother in London, where he was raised before spending his educational years in Bath. Following his undergraduate and post graduate studies at the universities of Brighton and Westminster, he started out his career as a Management Consultant at one of the leading consultancy firms in London working on high-profile projects within international blue-chip organisations. A serious accident then made him re-think his priorities and he decided to leave the consultancy world in order to pursue a lifelong passion he had - Chocolate! Marc was introduced to good quality fine chocolate from a very early age when his French grandmother would treat him to the finest chocolates made by Gaston Lenôtre when she visited him in London. He was fascinated by the great varieties in tastes and textures and admired the creativity of M. Lenôtre whom he would later meet personally during his training as a Chocolatier. His quest started with in-depth training at the prestigious Maison Lenôtre in Paris, where he was taught by world Masters and acquired the fine art of making artisan chocolates. He further fine-tuned his expert skills by learning with a number of Master Chocolatiers in France. From the outset, his vision was to create exquisite hand-made chocolates, which are inspired by his cultural background, and the inspiration he seeks from the surrounding community. His culture and experiences have inspired him to make the finest quality chocolates containing a wealth of superior ingredients sourced to the highest standards to ensure only the best is used, that on tasting will transport you back to magical experiences you have had and exotic places you have dreamed about. These exquisite flavours will trigger your aspirations and have you marvelling at the combinations we use to tantalise your taste buds. As well as freshly hand-making his fine chocolates for sale through the online boutique, Marc was commissioned by Fortnum & Mason within just one year, to be the only permanently named and featured chocolatier within the store. He has created the 'Fortnum & Mason Bespoke Selection' of chocolates using a variety of the famous store's exclusive ingredients with exciting new flavours regularly being created and introduced. "My chocolates are derived from pure passion. Passion for the traditional artisan craft and passion for the perfection of my finished product. This I bring to you with an explosion of contemporary flavours that will stimulate your imagination and make you want to experience the full collection of artisan delights. I command only the highest quality raw ingredients and select the finest cocoa butter to create a smooth chocolate that you can enjoy anytime. Keep up to date with our latest news by following our Blog and our Facebook page.